It’s been a while! PHDefence has still been going strong, but I’ve just not been posting. Busy, busy, busy. PHDefence was awesome this morning despite the low numbers again. Paul took them through some epic drills – really fun and unique too – I couldn’t help joining in; it was really enjoyable! 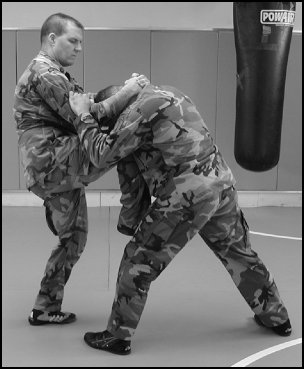 I took a section on ground mobility with some rather awesome Systema-inspired drills, and then took the higher grades through some more advanced knee striking including how to get effective knee strikes off on the ground, and then we finished off, as always, with a short session of Russian combat massage which everyone seems to enjoy a lot! I don’t blame you, it’s amazing. Also, PHDefence is the only place I’ve ever been to where I’ve seen it. Most martial arts places I’ve been to have been far too set in their ways for something like this, which is not a criticism; merely an observation. It is a reason why I think PHDefence is awesome though. They need more students, however. Very badly. In fact, if they don’t get a more reliable flow of students in soon, they will have to look at different venues and times, and all sorts, which could end up seriously inconveniencing a couple of their students. If you’re in the Stoke-on-Trent area, please get in touch if you’re at all interested! I want to help them as much as I can because it’s a real shame to see such a brilliant club go through hard times. Always-up-to-date details are on the classes page. On a lighter note, I have many plans. As soon as my ridiculous workload from university lessens a little, I have a few articles lined up for your enjoyment. The forum’s still going strong in terms of awesome material, but does need more members, so get yourself on there if you haven’t already! Also, once I clear a space in my schedule, I intend to start filming some videos for the CSPS YouTube channel so if you haven’t already, subscribe and you’ll get the uploads in your inbox the moment it happens! I’ve got some really useful material lined up, so keep yourself in the loop!